A while back, bedtime was spiraling out of control. The kids share a room; they would be wound up at bedtime and the transition to sleep was not happening smoothly. We had a big, big problem on our hands. We solved the problem with 10-minute reading time. The kids have to be in their beds. We dim the lights. We set a timer for 10 minutes. It has to be quiet during that time. Then we turn out the lights, give them something to picture in their minds, and sleep comes more easily. Complete transformation. It is awesome. One night, Tabitha (5 years old at the time) wanted to color. We talked and agreed that she could do it “sometimes”. As is the nature of 5-year olds, she soon wanted to know the limits. The following conversation took place on a Wednesday night. Tabitha (five years old): I know I can’t color every night but can I tonight? T: Then read, then color the next night? Me: I don’t know. I think reading twice before the next color is better. To be clear. It was not my intention to get into a math conversation at this point. I just wanted her to go to bed (Warning! Link Not Safe for Work, and Possibly Offensive to Sensitive Ears. But Funny). No, this move on my part was truly about literacy, not math. I don’t want 10-minute reading time to turn into 10-minute coloring time. I really, really like the idea that books will become part of my kids’ independent bedtime routines. But Tabitha loves to know the rules she’s playing by. And when those rules are based on numbers, they’re going to lead to math every time. Me: Right. That sounds like a good ratio. First of all, I used the term ratio with absolutely no expectation that she would process it, and I am quite sure that she did not. I have long been an advocate of using good vocabulary with my children—there is no shame in not knowing the meaning of a word, but also no sheltering them from the fact that these words exist. This is at least partly the source of their substantial vocabularies. But I do not believe she knows the word ratio. Secondly, Tabitha’s reformulation of the 2:1 ratio as 4:2 blew me away. It nearly slipped past me without notice. I was focused on getting them to bed; we were in the truly final phase of that process. I had pretty much tuned her out. But when I looked at her, I could see she was expecting a reply. She needed to know whether she could get two coloring nights in a row by doing four reading nights in a row. So I replayed her question in my mind, counting the reads. Me: Yes. That would be fine. You may do that. Together with the recent Easter Candy conversation, this makes clear that young children are thinking about early ratio ideas. Think about this for a moment. What is the same about these two sets of tiles? And what is the same about these two sets of tiles? In each cases, it is the ratio. 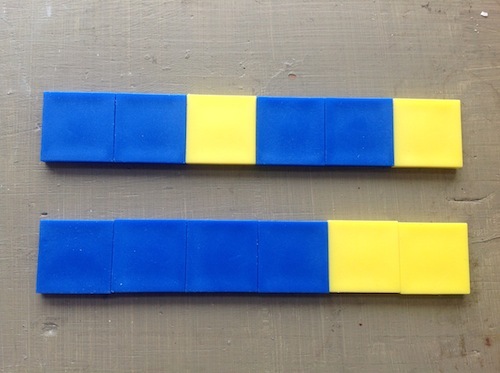 In the first case, there is one blue for every yellow up top and also down below. This is what L was working on when she offered a second chocolate egg to Tabitha. 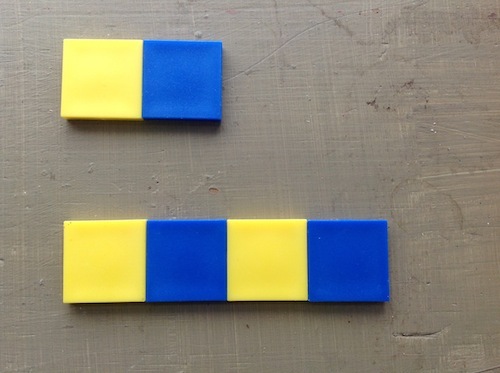 In the second case, there are two blues for every yellow. This is what Tabitha was working on when she asked about read-read-read-read-color-color. Traditionally we think about ratio as a sophisticated fractions topic that needs to wait for early adolescence. I certainly would not want to be held accountable for teaching 5-year olds ratio and the associated notation. But their everyday experiences allow for them to think about these ideas. As parents, we can keep an eye out for those opportunities and talk about them when they arise. Both of these ratio conversations with 5-years olds have resulted from constraints. Five year olds love to test rules. “Yes” and “No” are inflexible and allow no wiggle room. This is sometimes desirable. Yes, you must leave now to get to school on time. No you may not leave the house without pants. Yes you must look both ways before you cross the street. But when we are guiding our children’s behavior, we would be wise to allow some space for the little ones to test the boundaries. Does it really matter—in the big picture—whether L eats one chocolate egg or two? Does it really matter whether Tabitha colors two nights in a row instead of reading? I say no. Neither of these things really matters. What matters is that L does not continuously gorge on candy, and that Tabitha has some alone time with books. Constraints rather than absolute mandates seem to have encouraged mathematical thinking in both of these cases while also addressing the big picture. This entry was posted in Number and tagged 5 years old, ratio. Bookmark the permalink. The video link is not working. Link is fixed up. You can either thank me or curse me later for it. I’m sharing this with Mo’s teacher right away! Aw! What a great post! I think I love this site … as a “scientist” father, I am always trying to get facts and concepts across to my kids. I will use this today, and I’ll post an update. Thanks!